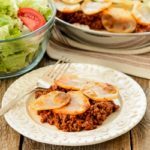 Potato Topped Sloppy Beef Skillet is an easy to prepare meal. Beef sloppy joe mix is topped with potato slices and browned under the broiler. Brown ground beef in a skillet over medium-high heat. Drain grease from beef and return beef to the skillet. Stir in skillet sauce and bring to a boil. Reduce heat to low to simmer. Peel and thinly slice potato (between 1/8-inch and 1/4-inch thickness). Arrange potato slices over sloppy joe mixture. Cover skillet and place in the oven. Cook until the potatoes are tender, about 30 minutes. Remove skillet from oven and switch oven to broil. Remove cover and place skillet under broiler. Broil until potatoes are lightly browned, about 3 to 5 minutes.